So it's the Civic Holiday/Simcoe Day weekend here in Ontario. Which for Mr. Ivriniel and I, means the annual Pirate Fest. We met at the very first pirate fest at Fort York in Toronto, and then Mr. Ivriniel asked me out at the first Pirate Fest in it's current location at Country Heritage Park in Milton, ON. The Fest has an adult evening program on Saturday nights which is always fun. We usually go during the day as well. This year we didn't get to the go during the day until Monday. For some reason we had trouble finding a lot of our pirate garb this time. Really have to get the clothes better organized. Anyways, when we got to the fest, I went looking for a new top. 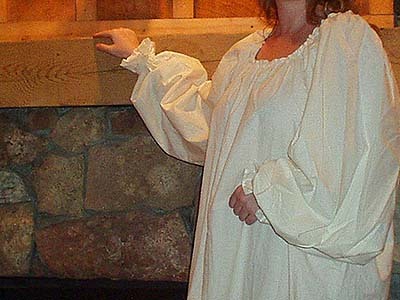 My current chemise I got at the old Ontario Ren Faire, and is beginning to get really ratty. So when I got to a booth that was selling them, I decided to try one on. Now with this style of chemise, you really can't wear it without a bodice, but I hadn't worn one that day. So I decided to use one that caught my eye. While I got changed, Mr. Ivriniel dropped to the next booth over which is run by a friend of ours to chat. So anyways, I come out of the changing tent, and Mr. I and my friend are there, and they are both "OMG that looks awesome on you!" So I kinda had to get it.